The 3rd-5th Grade PLC will meet on the following dates at the locations listed during 2nd semester. Heather Crowson is the facilitator. The meetings are open to all teachers of grades 3-5 and begin at 3:30 pm. The book study opportunities below will be offered on a first come first serve basis. Each group is limited to 12 participants and may not be repeated. If you are interested in participating, please email Angie Davis at adavis@tipton-county.com to sign up. The book will be provided for participants. Participants must attend all sessions in order to receive the PD points. Dates are published in advance for planning purposes. Jennifer Clark will lead a study of “Engaging Students with Poverty in Mind” on February 22nd , March 8th and March 22nd at Brighton Middle School in the library from 3:30 – 4:30 pm. 8 PD points. This is a repeat from 1st semester due to popular demand. David Perkins, a noted authority on teaching and learning and co-director of Harvard's Project Zero, introduces a practical and research-based framework for teaching. He describes how teaching any subject at any level can be made more effective if students are introduced to the "whole game," rather than isolated pieces of a discipline. Perkins explains how learning academic subjects should be approached like learning baseball or any game, and he demonstrates this with seven principles for making learning whole: from making the game worth playing (emphasizing the importance of motivation to sustained learning), to working on the hard parts (the importance of thoughtful practice), to learning how to learn (developing self-managed learners). Patrick Smith will lead this book study at Brighton High School in room 121 from 3:30 – 4:30 on January 26th, February 16th and February 23rd. Participants will receive 9 PD points. This is a repeat from 1st semester due to popular demand. This book study is open to K-5 teachers who attended professional development lead by Dr. Carol Tolman in Tipton County on June 6, 7, or 10, 2016 and already have the book. *What is all of this and why is it important to my classroom? Day 2 (January 26) 3:30-5:00 MES Where do I start with my students? *Phonics Expectations by grade level. What are my students’ learning gaps? *Using the assessment results to drive instruction. Matching lessons to students’ skill levels. *Discuss how the lesson was taught. *Research-based Walk to Learn activities without using all your copies! This book study will be led by Heather Crowson at Munford Elementary School on the dates and times listed above. Participants will receive 12 PD points. This is a repeat from 1st semester due to popular demand. Many states have worked to increase the rigor of their curriculum and many have revised their curriculum since the original adoption of the Common Core. Regardless of the name of the curriculum, educators were looking for the ways to translate the rigor of the new standards into practice. Enter the Core Six: six research-based, classroom-proven strategies that will help you and your students respond to the demands of a rigorous curriculum. Thanks to more than 40 years of research and hands-on classroom testing, the authors know the best strategies to increase student engagement and achievement and prepare students for college and career. Best of all, these strategies can be used across all grade levels and subject areas. Reasons for using the strategy to address the goals of the Common Core. The research behind the strategy. A checklist for implementing the strategy in the classroom. Multiple sample lessons that illustrate the strategy in action. Planning considerations to ensure your effective use of the strategy. Any strategy can fall flat in the classroom. By offering tips on how to capture students' interest, deepen students' understanding of each strategy, use discussion and questioning techniques to extend student thinking, and ask students to synthesize and transfer their learning, The Core Six will ensure that your instruction is inspired rather than tired. Led by Carlyn McMillian, participants will study the strategies, put them in practice and collaborate on ways to improve that practice. The group will meet at Munford Elementary School 3:45 - 4:45 pm on the dates below. Participants will receive 13 points for completing the study. This is a repeat from 1st semester. *Inspiring your students to want to behave. *Creating a simple classroom management plan. *Speaking with power and influence. *Building rapport and positive relationships. *Gaining control of any classroom. Led by Laura Joiner, this group will meet at Atoka Elementary School from 3:30 to 4:30 on the dates below. This book study is worth 10 points. In this professional development book study, participants will read and evaluate Donalyn Miller’s strategies and suggestions to help students become better readers in a world where text exploration is necessary for student success. Each participant will read the noted text individually and will meet several times after school to analyze the text. Participants will experience true professional development through peer interaction and collaboration and receive 10 PD points upon completion. This is a repeat from 1st semester due to popular demand. March 1, 2016 –3:45 P.M. Please note that the Fine Arts Professional Learning Community Meetings have been moved from Atoka Elementary to Brighton Elementary School. The remaining dates are listed below. Also, the date for the Core Six: Essential Strategies for Achieving Excellence in the Common Core book study meeting has been changed from November 8th to November 14th. All meeting times for that study are 3:45 - 4:45 at MES. The remaining dates are listed below. Look for new book study sign-ups when we return from Thanksgiving Break! With the implementation of Mastery Connect, a new PLC will begin meeting twice a month so that users may share and discuss ways to utilize the tool to drive instruction. The Mastery Connect PLC will be facilitated by Tracy Speight and will meet at the Brighton High School Library from 3:30 - 4:30. It is open to all grade levels and subjects. Please join this community and learn from your peers! For more information contact Tracy! Topics will include but not be limited to the following. Additional topics and dates will be added in the coming weeks! Beth Smith will be facilitating the Professional Learning Community Meetings for grades 1 and 2 this year. The first meeting will be held at Brighton Elementary in the library on October 18th from 3:30 to 4:30. For a complete list of meeting dates, please see below. Heather Crowson will be facilitating grades 3-5 Literacy Professional Learning Community Meetings for the 2016-17 school year. All are welcome. The meetings will rotate school sites - please check back here for changes and times. Laura Joiner has announced dates for the Fine Arts Professional Learning Community Meetings. All meetings will be at Brighton Elementary School. Please check back for times! The dates for the PreK-K Professional Learning Community have been announced by the facilitator, Janice Smith. The group will meet at Brighton Elementary school library at 3:30 pm on the following dates. For fall of 2016, Tipton County Schools will offer professional development opportunities for teachers on a variety of subjects through small group book study. These opportunities are detailed here and will provide teachers with the chance to collaborate on a topic in depth with other teachers across the county. Teachers will earn Professional Development Points based on the number of meetings and amount of worked required. In order to earn the PD Points, teachers must attend all the meetings as provided in the information. 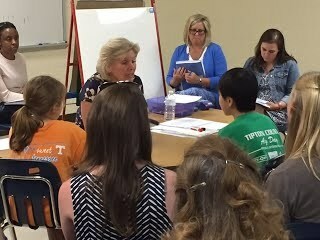 Tipton County Schools welcomed Dr. Carol Tolman, National Trainer for Language Essentials for Teachers of Reading and Spelling, (LETRS) to Crestview Middle School June 6-10, 2016. Dr. Tolman worked with 1st and 2nd grade teachers on teaching reading. Pictured above, Dr. Tolman modeled strategies with students. Start your new year off right! Join your peers from across Tipton County Schools to learn from each other and grow professionally while addressing current issues. Participating teachers will receive certificates of attendance. Tentative schedules for the remainder of 2015-16 are listed below. Please contact your grade level instructional coach for more information. Principals will be notified of any last minute changes. March 30, 2016 Looking at Quintiles & Growth/How Do We Challenge Our Upper Quintile? Join your peers from across Tipton County to discuss current issues in education, learn from each other, and grow professionally. Participating teachers will receive certificates of attendance. Contact your grade level instructional coach for more information.